The EA of old knew how to flog a franchise to death but now Activsion have taken this on to a whole new level and given Guitar Hero a damn good thrashing. This is the 12th (ninth on a home console) game in a series which only started in 2005. That is a lot of games in a short space of time add on this years pop sojourn Band Hero and that total tally is up to 13. And not a lot in gameplay terms has changed. 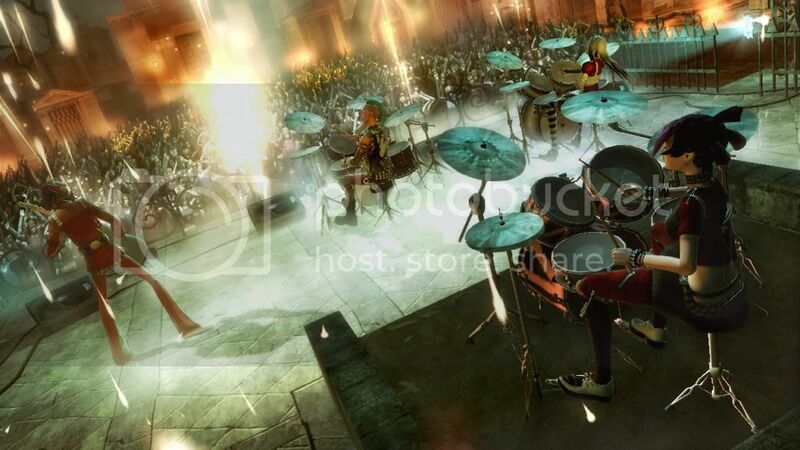 I know we have had mics and drums added but the basic gameplay has not changed. This though is not necessarily a bad thing because the gameplay is so good. Especially when in the company of friends this, and its compatriot Rock Band are still the greatest good time party games. Crank up the volume apply some alcohol and sit back and watch people make complete prats of themselves, its great! I swear something odd happens to people when they pick up that plastic guitar for the first time for a minute or two they are unsure then suddenly there they are strutting their stuff like an axe wielding rock god. So what’s new for this addition to the series? 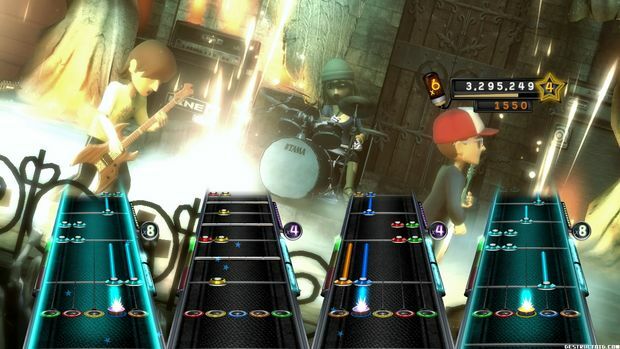 Not a lot really, there is now drop in drop out co-op play as well as the option to play with any collection of instruments and mics you wish. So if you have 4 drum kits you can play a song with 4 drum kits (can you imagine the racket that would make). You can now also choose to use your Avatar in game so you can look like a gay dweeb fronting a rock band (come on the one thing with these avatars is that they all look a little gay that’s not a bad thing just a strange fact). And for additions to the game that is it. As with any of these type of games it’s the track listing that is important. Guitar Hero 5 does not disappoint there 85 tracks all master tracks from 83 artists. And its the most eclectic bunch of tracks yet from Coldplay through the Gorillaz to Wild Cherry plus all the usual guitar heavy metal the series is so well known for. Also for the first time for a nominal fee you can use some of the music from Guitar Hero World Tour and Guitar Hero Greatest Hits in this game and all the downloadable stuff from World Tour is useable too (about time too Activision). So that’s it you will already know if you are going to like this and little we write will sway you. As I said earlier it is great party fare but 12 games in 5 years is pushing the limit of taking the piss out of their consumers. But in the end it does very little wrong other than that.